Don’t you just love it when a bodybuilding supplement exceeds your expectations? We wish this happens more frequently. Country Life Max For Men is about to blow you away -it’s primed to make a huge difference. Buckle up and enjoy the review, folks. Insane vitamin B12 content. Whopping 8,333 percent of the daily value. High vitamin B3 level. Potential double-edged sword. Large tablets. Horse pills, anybody? Other Ingredients: Cellulose, stearic acid, silica, starch, cellulose & glycerin coating, magnesium stearate, maltodextrin, natural flavors, sunflower oil, vegetable glaze. Directions: Adult males take two (2) tablets daily with food. As a reminder, discuss the supplements and medications that you take with your health care providers. We’ve sized up some solid men’s multivitamins here on B5. One which comes to mind is GAT MENS MULTI + TEST, which has an awesome 500 milligrams of tribulus fruit powder per serving. So, if you’ve been searching long and hard for a multivitamin which also doubles as a testosterone booster, this is it. Another one is NOW ADAM, whose bonus ingredients such as saw palmetto, grape seed extract, inositol, and lutein can help boost your long-term health. Men the world over will rejoice. We’re hoping Country Life Max for Men can join their elusive ranks. This supplement is “a multivitamin and multimineral complex that includes key nutrients for men’s health such as ‘coenzymated’ B vitamins for energy metabolism and magnesium for heart health plus saw palmetto and lycopene,” per its official website. “Max For Men uses Country Life’s exclusive Maxi-Sorb delivery system,” per the same source. 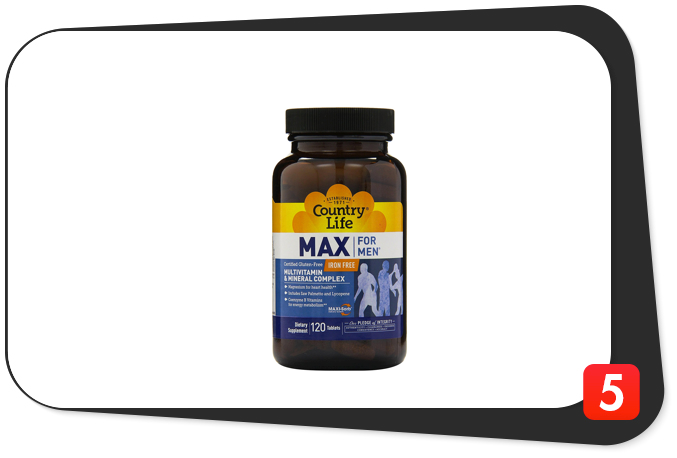 Country Life Max For Men should help ramp up men’s energy levels and boost long-term health. Our first impression: Country Life Max For Men covers all of the bases for men’s long-term health. Just look at the comprehensive ingredients list. It’s also a major plus whenever a bodybuilding product maximizes the bioavailability of its components. You’ll get better overall results, for sure. The first thing we look for in a multivitamin product is an “All-Natural” or “ISO-Certified” label. The bad news: we found neither. The good news: we found an alternate “Pledge of Integrity” on Country Life Max For Men’s label. We like it because the manufacturer gives customers the assurance Country Life Max For Men has no fillers and synthetic ingredients. However, it’s not as assuring as a “GMP (Good Manufacturing Practices)” or “ISO-Certified” stamp of approval. We know you’ll agree with us. Nonetheless, this product’s “Pledge of Integrity” should help put you at ease. Now, the manufacturer’s website never states Country Life Max For Men is meant for athletes. However, it may as well be. Hard evidence: the high B vitamin amounts. Just so you know, B vitamins help increase energy levels and boost cardiovascular function. This multivitamins B vitamin levels are similar to those of GAT MENS MULTI + TEST. The thing is, Country Life Max For Men’s insane vitamin B12 content (8,333 percent of the daily value) sets it apart. It’s clear as day, folks: Country Life Max For Men’s B vitamin content clearly trumps GAT MENS MULTI + TEST and NOW ADAM’s. Well, even if a man is not an elite athlete, he will experience insane energy levels and better heart health over the long haul, that’s for sure. When we size up multivitamins, we also stress the inclusions of vitamin D, vitamin K, chromium, and copper. Simply put, many manufacturers overlook these crucial ingredients. For instance, many men stay cooped up in their offices for hours. The result: they don’t get enough vitamin D from sunlight. That’s one good reason to fill your nutrition gaps with a multivitamin. For its part, Country Life Max For Men is a decent source of vitamin D at 50 percent of the daily value. That much should help improve men’s heart health, strengthen their bones, and ward off nasty free radicals. On the other hand, the trio of vitamin K, copper, and chromium help regulate immunity, ramp up energy levels, and promote healthy blood sugar and blood pressure levels. We’re glad Country Life Max For Men has these components. Just like GAT MENS MULTI + TEST, this supplement’s strength lies in its extra health-boosting ingredients. This is nothing new – many multivitamins have these components (inositol, saw palmetto extract, choline, betaine, lycopene, etc.). On the bright side, these are a sure bet to shore up men’s long-term health. If you’re not eating enough fruits and vegetables, this means you. If you think Country Life Max For Men is perfect, you’ve got another thing coming. Among this product’s chinks are a proprietary blend (Health Blend), tablet size, and a possible niacin flush side effect. Some customers say the tablets are too large for their liking – and to think you have to take two daily. Finally, Country Life Max For Men has one of the highest vitamin B3 levels (500 percent of the daily value) we’ve seen – this may result in a burning and tingling sensation in the face and chest. Despite these shortcomings, Country Life Max For Men lives up to the hype. Vitamin A (as beta carotene, retinyl palmitate, natural mixed carotenoids), 10,000 IU: Vitamin A has a sterling reputation in terms of long-term eye function. It’s more than just that – experts say it also helps increase muscle mass and strengthen bones. Vitamin C (as calcium ascorbate, ascorbyl palmitate), 300 mg: Vitamin C has long been a remedy for the common cold. However, little do some men know it’s also a powerful antioxidant. Need hard evidence? Check out our vision product reviews. It gets better, folks: vitamin C also helps regulate blood pressure levels, improve cardiovascular function, and produce collagen (the protein found in connective tissue). Vitamin D (D3)(as cholecalciferol), 200 IU: A vitamin which helps keep free radicals at bay, shore up heart health, and strengthen bones and teeth. Vitamin E (as d-alpha tocopherol acid succinate), 400 IU: Vitamin E is another powerful antioxidant found in many multivitamins and vision support products. Not only that, but it also helps boost heart health and shorten recovery time. Vitamin K (as phytonadione), 50 mcg: Vitamin K helps regulate blood clots, boost immunity and digestion, and strengthen bones. Thiamin (vitamin B1)(as thiamine hydrochloride, thiamine cocarboxylase chloride), 25 mg: This component helps ramp up energy levels and improve cardiovascular function. A fantastic 1,667 percent of the daily value for vitamin B 1 will go a long way. Riboflavin (vitamin B2)(as riboflavin, riboflavin 5′ phosphate), 25 mg: This B vitamin helps ramp up energy levels and boost the immune and digestive systems. One thousand four hundred seventy-one percent of the daily value is a sure bet. Count on it. Niacin (as niacinamide, niacin, inositol hexanicotinate), 100 mg: An ingredient which helps improve cardiovascular function and joint mobility, regulate nerve function, and promote healthy blood pressure levels. Country Life Max For Men has one of the highest niacin levels among multivitamins at an impressive 500 percent of the daily value. Vitamin B6 (as pyridoxine hydrochloride, pyridoxal 5′ phosphate), 25 mg: This B vitamin helps shore up heart health, regulate the nervous and immune systems, and improve kidney function. You simply can’t go wrong with an awesome 1,250 percent of the daily value, folks. Folic acid, 800 mcg: Simply known as vitamin B9, this component helps lower anxiety levels, repair skin cells, ward off nasty free radicals, improve cardiovascular health, and increase muscle mass. Vitamin B12 (as methylcobalamin), 500 mcg: Just like vitamin B1, vitamin B12 helps increase energy levels and improve heart health. Country Life Max For Men’s insane 8,333 percent of the daily value for vitamin B12 is the real deal. Biotin (as d-biotin), 300 mcg: Simply known as vitamin B7, this ingredient helps improve hair, nail, and skin health. Not only that, but it also helps repair muscle tissue and ward off inflammation. Pantothenic acid (as calcium d-pantothenate, pantethine), 250 mg: Vitamin B5 helps lower stress levels, regulate the immune system, ramp up stamina, and boost cardiovascular health. Calcium (as calcium hydroxypatite, calcium ascorbate, calcium d-pantothenate, calcium citrate, dicalcium phosphate), 100 mg: Country Life Max For Men is a mediocre source of calcium at just 10 percent of the daily value. Phosphorus (as calcium hydroxypatite, dicalcium phosphate), 21 mg: Country Life Max For Men is not a significant source of phosphorus at a measly two percent of the daily value. Iodine (as potassium iodide), 225 mcg: This ingredient helps regulate thyroid function, stifle bacterial activity, increase energy levels, boost dental and hair health, and ward off nasty free radicals. Magnesium (as magnesium oxide, magnesium rice chelate, [rice-protein-based]), 200 mg: This mineral helps improve cardiovascular function, improve sleep quality, keep stress levels in check, and increase testosterone and energy levels. Zinc (as zinc monomethionine), 30 mg: A versatile mineral which helps increase testosterone levels, improve sleep quality, strengthen bones, regulate immunity, boost brain health, and keep free radicals at bay. Selenium (as l-selenomethionine), 200 mcg: Selenium helps boost the immune system, ward off free radicals, and regulate thyroid hormone production. Copper (as copper citrate), 1 mg: Copper helps stimulate brain activity, ramp up energy levels, and increase iron absorption. Manganese (as manganese citrate), 5 mg: This mineral helps promote healthy blood sugar levels, regulate thyroid function and digestion, and keep inflammation at bay. Chromium (as chromium picolinate), 200 mcg: This mineral helps lower bad (LDL) cholesterol levels, boost vision, and regulate blood pressure and blood sugar levels. Molybdenum (as molybdenum amino acid chelate [rice-flour-based]), 50 mcg: This ingredient helps stifle free radical activity, boost dental health, and facilitate the elimination of waste products. Potassium (as potassium citrate, potassium iodide), 99 mg: Country Life Max For Men is not a significant source of potassium at a paltry three percent of the daily value. Inositol (as inositol, inositol hexanicotinate), 100 mg: A natural compound which helps boost fat loss, regulate cholesterol levels and nerve function, and boost skin and hair health. Saw palmetto extract (berry)(45 percent fatty acids equal to 22.5 mg), 50 mg: This plant helps improve prostate and urinary tract health, regulate testosterone levels, and keep hair loss at bay. Grape skin extract (50 percent polyphenols equal to 25 mg including proanthocyanidins), 50 mg: This ingredient helps boost heart health and circulation, regulate cholesterol and blood sugar levels, and keep free radicals at bay. Choline (from 100 mg choline bitartrate), 41 mg: This macronutrient helps improve cardiovascular function, regulate metabolism, and boost memory. Betaine (from 20 mg betaine hydrochloride), 15.2 mg: This amino acid, a beetroot byproduct and staple of many pre-workout and post-workout supplements, helps improve cardiovascular function, boost muscle protein synthesis, increase endurance, and ward off fatigue. Lycopene, 2 mg: A red carotenoid pigment which helps boost heart health, keep free radicals at bay, improve long-term eyesight, and protect the skin from excessive ultraviolet light. Boron (as boron citrate), 1 mg: This mineral helps shore up cardiovascular health and ward off free radicals. Eleuthero extract (Eleutherococcus senticosus)(root)(0.8 percent eleutherosides): This medicinal herb helps keep fatigue at bay and regulate cholesterol levels. Marigold extract (flower)(10 percent lutein esters): This flowering plant helps ward off inflammation, boost eye health, and keep cramps and spasms at bay. After a thorough analysis, we deem Country Life Max For Men is much more than just a vitamin and mineral complex. You can start with the high B vitamin levels – a sure-fire way to ramp up a man’s depleted energy levels and improve his heart health. It bears repeating: the manufacturer didn’t intend Country Life Max For Men as an athlete multivitamin, but it has the makings of one. In fact, its insane 8,333 percent of the daily value for vitamin B12 (methylcobalamin) ranks as the second among our multivitamin reviews (only NOW Men’s Extreme Sports Multi has more at a whopping 16,667 percent of the daily value). Now, that’s making a resounding statement, folks. We also love Country Life Max For Men’s additional health-boosting ingredients. The inclusions of inositol, saw palmetto extract, grape skin extract, choline, betaine, and lycopene will give you a fast return on your investment. More specifically, you’ll enjoy lower cholesterol levels, better prostate health, improved heart health, and increased antioxidant protection, among other things. We also laud the manufacturer for including key ingredients such as vitamin D, vitamin K, chromium, and copper. Like we said, many competitors overlook these. Men need these components for better overall health. With these around, expect stronger bones, improved thyroid function, and increased energy levels. Don’t ignore Country Life Max For Men’s Pledge of Integrity, folks – this assures customers it has no synthetic ingredients whatsoever. GMP or ISO certification would have been better, but we’ll take it. Unfortunately, Country Life Max For Men has a few downsides. First, its Health Blend is proprietary in nature – the company doesn’t break down the individual ingredient amounts. Second, this multivitamin has one of the highest niacin (vitamin B3) levels on the market (500 percent of the daily value). The downside: it may cause niacin flush, the burning and tingling sensation we discussed earlier. Not to worry, though: experts say this means vitamin B3’s effects are starting to kick in. The effect will also go away after a few minutes. Finally, Country Life Max For Men’s tablet size is enormous – some customers compare them to horse pills. Nevertheless, this multivitamin exceeded our expectations on many fronts. It many not be perfect, but it’s worth it. We agree with all of these claims. Country Life Max For Men is a top-notch men’s multivitamin which should deliver the goods in more ways than one. The manufacturer intended Country Life Max For Men for healthy and active males who want to fill nutrition gaps, increase energy levels, achieve their daily fitness goals, and boost long-term health. Country Life Max For Men has 500 percent of the daily value for vitamin B3 (niacin), an ingredient which may cause niacin flush (a burning and tingling sensation in the face and chest) in some individuals. If this, or any other ingredient, makes you feel doubtful, please consult your physician before buying Country Life Max For Men. Impressive. Ingredients list says it all. High B vitamin levels. Comparable to those of athlete multivitamins. Insane vitamin B12 content. Impressive 8,333 percent of the daily value. Has vitamin D, vitamin K, chromium, and copper. All good. Additional health-boosting ingredients. Inositol, saw palmetto, grape skin extract, choline, betaine, and lycopene. Pledge of Integrity. Assures customers product has no fillers. Good reputation. Customers have sung this multivitamin’s praises. High vitamin B3 levels. Five hundred percent DV could be potential double-edged sword. Health Blend. Proprietary in nature. Boo. In the beginning, we expected Country Life Max For Men to complement the modern man’s lifestyle perfectly. 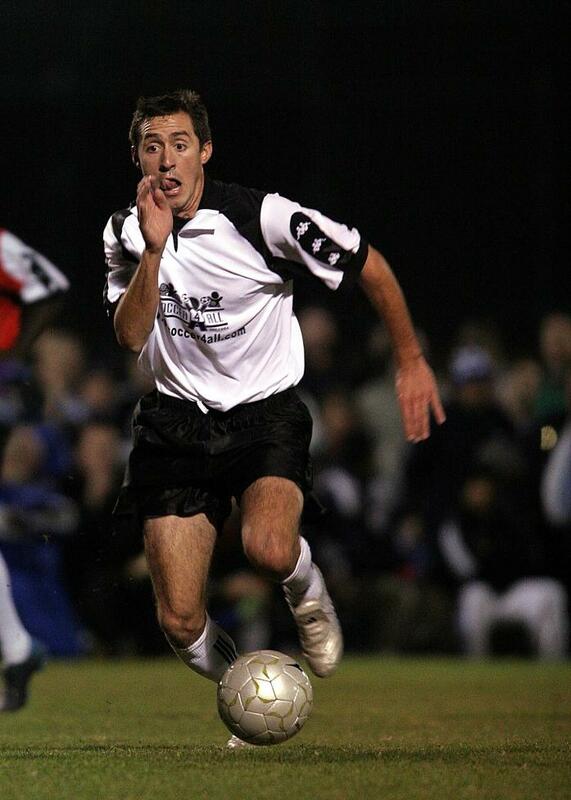 It turns out it can also double as an athlete multivitamin – which is an awesome feature, to say the least. Not only that, but this multivitamin is a sure-fire way to boost men’s long-term health. We recommend you buy Country Life Max For Men and reap its immense benefits today.